The 751 rebates for purchase of home storm shelters awarded in a lottery so far by the state have been concentrated in the Oklahoma City area, disproportionate to its share of the state population. Relatively few rebates were won in the state's outlying areas. The greater Oklahoma City area, with 35 percent of the state's population, received 74 percent of the rebates. The Tulsa area received relatively few storm-shelter rebates for its population count. 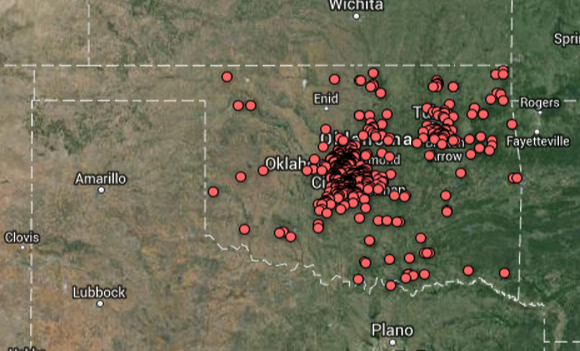 When mapped, data from the National Weather Service shows that tornadoes from 1990 through May 2013 touched down in all parts of the state, although the deadliest and most destructive struck central Oklahoma. Twice since 2012, Oklahoma has held a random lottery to award rebates to residents to help them pay to install storm shelters in their homes. About 750 Oklahomans have won the right so far to receive up to $2,000 in federal funds, channeled through the state, to defray the costs of a residential storm shelter. About 250 more rebates are still being distributed. State data obtained by Oklahoma Watch, however, shows that although the storm-shelter rebate lotteries were random, the money was not always distributed proportional to population. Some cities, such as Edmond, Moore, Yukon and Norman, got shares well above their percentages of the state population. Edmond residents won 106 rebates, only seven fewer than Oklahoma City residents. Edmond has won 14.1 percent of rebates so far despite comprising 2.2 percent of Oklahoma’s population. Oklahoma City’s share was similar to its population percentage, over 15 percent. Other cities, such as Tulsa, Lawton and Muskogee, got much less. Tulsa comprises about 10 percent of Oklahoma’s population but residents won just under 2 percent of the rebates. Some areas, such as the southwestern, northwestern and far southeastern parts of the state, received only several grants. The Panhandle received none. Data from the National Weather Service’s Storm Prediction Center shows that tornadoes touch down in all parts of the state. In general, residents outside the state’s largest urban areas got the short end of the draw. Outside of greater Oklahoma City, Tulsa and Lawton, residents received about 15 percent of the rebates, less than half of their 37 percent of the state’s population. The Oklahoma City “combined statistical area,” which includes eight counties, contains 35 percent of the state’s population, but won 74 percent of the rebates. Sixty-three of the rebates were not awarded randomly. They were set aside for residents in Canadian, McClain and seven other counties whose homes were destroyed in deadly storms in 2011. However, removing those from the count would have a small effect on the percentages won by each city or metro area. State officials say the reason for the pattern is either that people in some areas were lucky or more residents from those areas applied. Keli Cain, spokeswoman for the Oklahoma Department of Emergency Management, said rebate recipients are chosen randomly by a computer program designed by the state. When winners withdraw, alternate names are drawn. The SoonerSafe Safe Room Rebate Program began in 2011 and lotteries were conducted in January 2012 and January 2013. The program’s $2.4 million funding allows for about 1,000 rebates. The program is separate from most of the direct aid from the Federal Emergency Management Agency provided to people whose homes were damaged or destroyed in major tornadoes. SoonerSafe also is separate from federally funded rebate programs sponsored by individual counties or cities. The emergency management agency initially promoted the SoonerSafe program through news conferences, press releases and social media. About 15,000 people applied the first year. The marketing since has lessened because of the number of applicants, Cain said. “More than 22,000 people are already registered and we only do about 500 (rebates) per year,” Cain said. Casey Moore, marketing and public relations manager for the city of Edmond, said one factor in the city’s large share of awardees could be that it experiences more housing construction on average than other communities. Eric Stewart, 43, of Edmond, was among the winners in the 2012 drawing. He said he heard about SoonerSafe rebates while watching a television news report. He immediately applied online. “My wife … asked me what I was doing and I told her. She said I’d never get it and not to bother,” Stewart said. He submitted the application anyway, and found out in February 2012 that he’d been selected. According to the agency’s website, applications for rebates must be submitted online. Stewart said he wonders if that creates a disadvantage in rural areas, where broadband access is scarcer. Cain said she doesn’t think the online-only application has prevented anyone from applying. The department has taken a few applications over the phone from some people who didn’t have Internet access. Income could play a role in the dominance of some areas. In low-income parts of northeast and southern Oklahoma City, for example, relatively few homeowners received rebates, state data shows. In May, Oklahoma Watch published a story that found the rules of the SoonerSafe program create a disadvantage for low-income residents. Income is not an eligibility factor, and winners must pay the full cost of a shelter up front, then wait for up to eight weeks for rebates. Rental properties, where many lower-income people live, are ineligible. Residential shelters can cost anywhere from about $3,000 for a underground shelter in a garage to $10,000-plus for an above-ground safe room. The emergency management department plans to hold another lottery in 2014, depending on federal funding. Cain said the department does not anticipate having trouble securing the funding. Residents in some Oklahoma cities have won disproportionately large shares of rebates in the state’s residential storm-shelter program.